Impeach Eric Holder? Get serious! Oh Dear, the House GOP is at it again. Actually, they’ve never really stopped, but they’ve reached a new … standard? Eric Holder testifying before the House Oversight Committee. O Dear, they plan to impeach the Attorney General of the United States. So, the clown car that is the Republican Caucus in the House of Representatives has done everything possible to prove they are the ultimate in Congressional obstructionism, garnering for themselves a nine percent approval rating in the process. Nine percent. Think about that. Colonoscopies get a higher approval rating from the American public. Paris Hilton is more popular than the GOP — and she only had a 15 percent approval rating at the height of her 15 minutes of fame. Lawyers are more popular; banks — the ones that were responsible for the big crash of 2008 — are more popular. The company responsible for the 2010 oil well disaster in the Gulf of Mexico, British Petroleum (BP), airlines, all more popular than the House GOP. The idea of the U.S. becoming a communist nation is more popular. My god! The Internal Revenue Service is more popular than the House GOP! So, with their record-breaking low approval ratings with the people of America (the voters) what does the House GOP Caucus decide to do? Bow to teabagger sentiment and add fuel to the fire of division and polarization. When jobs bills are stalled in Congress, when poor people are getting forced deeper into poverty — Americans with jobs mind you and nearly a million veterans — the House GOP decides to impeach Attorney General Eric Holder. Good luck with that, teabaggers. Representative Pete Olson of Texas from his video ad of why he opposes the Affordable Care Act. You see, the only thing Rep. Olson and his cohorts can do is write up the articles of impeachment. It’s a good bet a majority of House Republicans will vote for them, ensuring the articles of impeachment will pass, but that’s where it will end. The Senate actually has to hold the trial, the actual impeachment and with the Democrats in control of the U.S. Senate, well that’s just not going to happen. What’s more, everybody knows it, including the teabaggers that started this ball rolling. But, for them and their ever-dwindling teabagging constituency, just writing up those articles is considered an accomplishment. What’s the Neil Young song? “Everybody Knows This Is Nowhere.” Okay, the lyrics don’t really apply here, but the sentiment of the title fits perfectly. Maybe Neil could do a re-write for the GOP of the 21st Century. And a belated Happy Birthday to Neil Young. He turned 68 on November 12. Back to the useless impeachment proceedings by the House GOP. According to reporting from Reuters, 10 other House Republicans will co-sponsor the impeachment bill, five of which are from Texas. That probably surprises no one. Texas seems to be teabagger central these days, what with leading clowns Senator Ted Cruz and Congressman Louie Gohmert standing tall for their tea. Here’s an interesting factoid about the Texas branch of the teabagger wing: Texas Senator John Cornyn isn’t conservative enough for them so they are contemplating a primary challenge to unseat Cornyn. And their candidate for the task is none other than Louie “stop the terror babies!” Gohmert. No one outside of the GOP wonders why the group formerly known as the Party of Lincoln is so unpopular. Their teabagging wing keeps electing nutbars like Gohmert. Rep. Darrell Issa on Meet the Press trying to justify his never-ending investigations. And Pete Olson, who didn’t take the decision to impeach the attorney general lightly. Seriously, if you think about it, shouldn’t he have gone after the president instead? Yep, Olson had to think about that one a while, but his California buddy Darrel Issa has provided much, if not all, the ammunition for an assault on Eric Holder. In the run up to the 2010 mid-term elections Issa vowed to keep the Obama Administration mired in scandals and investigations if the GOP won control of the House of Representatives. And so he has. The list of non-gates include: Fast and Furiousgate, Benghazigate, IRSgate, Solyndragate and … geez, I forgot a gate … well, we can be forgiven for not remembering all of the non-scandals Darrell Issa tried his damnedest to turn into scandals. Issa is the chairman of the House Oversight Committee so he has the power to start investigations for any and everything. So, Rep. Issa has tangled with Attorney General Eric Holder a number of times during his various “investigations” and even declared Holder to be in contempt of Congress. In unrelated news: Stephen Colbert testified before Congress in 2010 to try and help push along immigration reform. It was great TV and most of the legislators enjoyed Colbert’s schtick. 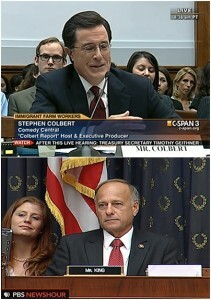 GOP Rep. Steve King of Iowa was one of those who didn’t like Colbert’s performance. In all fairness to Attorney General Holder, a lot of people hold the GOP-controlled House of Representatives in contempt. They are a contemptible bunch. So the Pete Olson’s of the Congress, i.e. the teabaggers, have all they need to write up articles of impeachment. They will most likely pass in the House of Representatives and then get sent to that trash pile with the hundreds of other bills they have passed that didn’t go further in the law-making process. Most of America wonders, “When will Congress do something useful?” But the shrinking constituency that calls itself the “Tea Party” loves this sort of thing. The House GOP teabaggers are doing something! Which, in the real world, is nothing. Continue to unrealistically vote to end Obamacare — done. Continue to attack women through health issues —d one. Continue trying to undermine voting rights — done. Continue to try and force poor people into total poverty and starvation — done. Try to impeach the president or a member of his cabinet — done. And so it goes, to quote the great Kurt Vonnegut. As we lurch towards the 2014 mid-term elections the House GOP continues it’s slide into oblivion, cheered on by the shrill voices that populate radical right wing radio, TV and the Internets. The upside is the voters will be looking to make a change. Nutbars like Olson and Gohmert will be re-elected, but in much of the country people will be looking to put in place a Congress that is willing to work with the president on fixing America. Clearly, the GOP does not qualify. The only question that matters to the teabaggers, the people who control the GOP, is this: how many more times can the House vote to repeal Obamacare before the 2014 elections? That’s progress in Teabaggerville: getting nothing done.